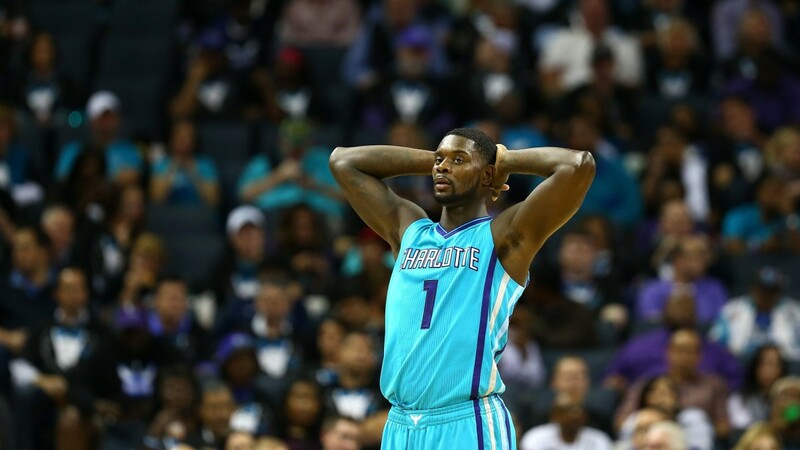 When the Hornets signed Lance Stephenson to a 3-year $27 million contract on July 18, 2014, many people looked at the deal as a steal for the Hornets. Sure Lance had some attitude issues, but the talent was clearly there. It was worth taking a risk to sign a player with the talent Lance showed in his time in Indiana. Funny how things change in less than a year. That deal is now looked at as a horrible overpay for a guy who was disappointing in his first year in Charlotte, to put it nicely. From Indiana to Charlotte, his field goal percentage dropped by 12%, 3-point percentage by 18%, and free throw percentage by 9%. At the beginning of the year, it seemed like he just needed to get acclimated to his new Hornets teammates; but as the season wore on, it became obvious he just didn’t fit in. Coach Clifford made it clear during Stephenson’s DNP’s towards the end of the year that he just couldn’t find lineups that played well with Lance on the floor. That literally might be the worst thing that could be said about you when it comes to basketball. I certainly hope that this isn’t a case where a player finally gets a nice paycheck and no longer puts the time in to improve as a player. I certainly understand a player who doesn’t fit into a certain system or on a certain team, but the fact that you shoot 17% from 3 (very often unguarded) after shooting a league average 35% the year before, is a VERY alarming stat. According to Basketball Reference, Lance’s 17.1% from 3 is the worst in NBA history with at least 100 attempts. There have been some arguments that it is the players on the court that surround Lance. To compare apples to apples, the lineup of Kemba, MKG, Marvin, Al and Gerald scored 12 points more and allowed 16 points less per 100 possessions than the same lineup without Gerald and with Lance. That is downright awful. Not only was he a liability offensively, but to many peoples surprise, he was equally as bad on defense. I would expect the Hornets to try to move Lance this summer but be unable to do so since his stock is so low. Luckily, the team has a team option after next season and may be able to move him as a more valuable expiring contract. These are five of the nine players with the most minutes on the team, despite the number of games missed. Injuries to players that play as often as these guys do really mess up rotations and chemistry, especially when four of these five are the teams usual starters. With no Kemba or Al you really take a hit offensively. With no MKG or Biz, you take a big hit defensively. Would you like to hear an interesting stat? The Hornets are paying Tyrus Thomas $9 million this season! I know many Hornets fans are quick to blame Coach Clifford for this teams lack of success this year. While I would agree that he hasn’t been great this season, I don’t really think he is to blame. This team flat out doesn’t have the talent to be a legitimate playoff threat. The Hornets are the worst three-point shooting team in the NBA this season. Also, they had the second worst overall shooting percentage in the league. This team plays basketball like it is 1970 and there is no three-point line. Pick and rolls. Low post feeds. Mid-range jumpers (I’m looking at you Gerald Henderson). The offense is so vanilla and basic that the Hornets had the least amount of turnovers in the league this season. Depending on who you ask, Kemba Walker is somewhere between the 10th and 15th best point guards in the NBA, but he is arguably the best player on this team (I disagree, but even Clifford has said this). He can score but he is often inefficient and takes shots that he shouldn’t. Coach Clifford said in his exit press conference on Thursday that on an ideal team, Kemba would be your 3rd or 4th best scoring potion. So as you can see, he still is quite efficient, but he is having a hard problem staying healthy. He mentioned in his exit press conference on Thursday that he will most likely opt in to the final year of his contract, and would like to try to lose 25 pounds, because his weight is beginning to catch up with him as he gets more miles on his legs. MKG still isn’t ready to be a serious offensive weapon despite his defensive excellence; and Cody Zeller is inconsistent game to game scoring and still commits frustrating fouls. Believe it or not, Gerald may be the most consistent player on the team, and that is a problem. He is a competent NBA scorer and defender, but that is about it. If you are relying on him to make a lot of plays, it probably won’t go well for your team offensively. Coming off the bench, I think the addition of Mo Williams was a good one. He can often be a shoot first point guard, but on a team that struggles to score that isn’t the worst thing in the world. The offseason addition of Marvin Williams was decent. He shot 35% from 3 this year, which is alright for a “stretch 4”, but personally I would rather have the $7 million he is making per year back and give Noah Vonleh more minutes. Lance is what Lance is (no bueno). Biz can protect the rim but has a hard time catching a ball or doing anything on offensive for that matter. I hear a lot of Hornets fans screaming at the top of their lungs for PJ Hairston to play more, but he isn’t ready for real NBA minutes. Yes, he is a three-point specialist. Problem is he shot 30% from 3 this year, and 60% of his shots while on the floor came from downtown. If he isn’t hitting his shots, he literally does nothing else on offense and often looks lost on defense. I attribute a lot of these problems to bad drafting. in the last five seasons. For example, here is a list of notable players drafted after Biz at number seven in the 2011 draft: Klay Thompson, Kawhi Leonard, Kenneth Faried, Reggie Jackson, Jimmy Butler, Chandler Parsons. I do understand you won’t hit a homerun every draft, but there are a countless number of players that the Hornets missed out on in the last half decade. Rich Cho & Co. need to do a better job this year with their projected 9th overall pick. Lastly, the thing that everybody seems to forget about is the loss of Josh McRoberts. He made plays for everyone last season. A lot of the offense ran through him, and he made great passes to set up other players. He brought much more playmaking to the table than Cody/Marvin have, and he is a big reason for the offensive drop off this year. Here is where you can start to blame Coach Clifford. There were far too many blown leads in the fourth quarter this year that a better coached team wouldn’t allow to happen. I specifically remember a game earlier in the season against Orlando where the Hornets blew a 20 point fourth quarter lead to lose. This was one of the few games where I remember where I was when I found out the lead was blown. I was leaving work and I looked at the score of the game. In the third quarter Charlotte was up by 23. I thought to myself “This one is over”. Well, it wasn’t. I pulled into the driveway, looked at my ESPN ScoreCenter App and gave out a “WHAT THE HELL”. We lost….but how? For as good as a defensive coach that Steve Clifford is, he isn’t the greatest offensively. This team becomes extremely difficult. So often, the play is Pick and Roll with Kemba and Al. This may sound like a decent idea to run with your two best offensive players; but when you have MKG, Cody, and Gerald/Lance, you have no floor spacing and it becomes easier to stop. A Kyrie Irving/Timofey Mozgov P&R works better when you have Kevin Love, JR Smith and Lebron on the floor. This is where the awful three-point shooting comes back into play. The other common late game play that gets drawn up is the Big Al on the left block. When you know an Al Jefferson post up is coming, it also becomes easy to stop. You can double team him and be less concerned about him hitting someone for an open three when you don’t have weapons to do so. All of this basically means that the Hornets become too easy to stop. When you can’t consistently score, good luck holding late game leads. So there it is. It sure is going to be an interesting offseason for the Hornets. Big Al has a $13.5 million player option. They also likely have a top 10 pick, Mo Williams will be a free agent, and we will see if the front office decides to give Biz a qualifying offer. Hopefully Rich Cho makes some good decisions this offseason because if he doesn’t, it may be his last offseason in Charlotte.